100% natural, tasty instant soup. 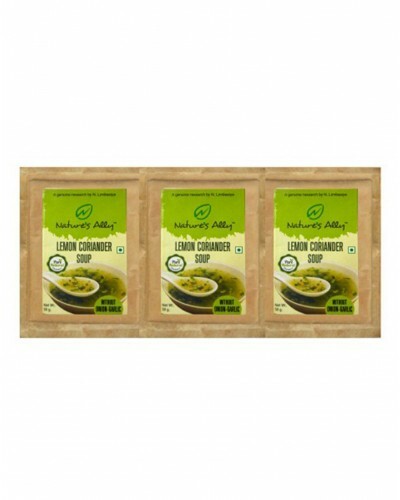 Packed with goodness of lemon & coriander. Formulated with Lemon Powder : It is a great antioxidant Coriander : Coriander has multiple health benefits. Coriander or cilantro is a wonderful source of dietary fiber, manganese, iron and magnesium as well. In addition, coriander leaves are rich in Vitamin C, Vitamin K and protein. Uniqueness of the Product - A Natural soup without any artificial fragrance, color, preservative, additives or thickening agent. It is in the powder form, packaged in sachets precisely measured for each day’s personal needs and very convenient to carry. Just mix the contents of sachet in water and boil it for two minutes whenever you want to make Instant Lemon Coriander Soup. A quality Product from Nature's Ally.